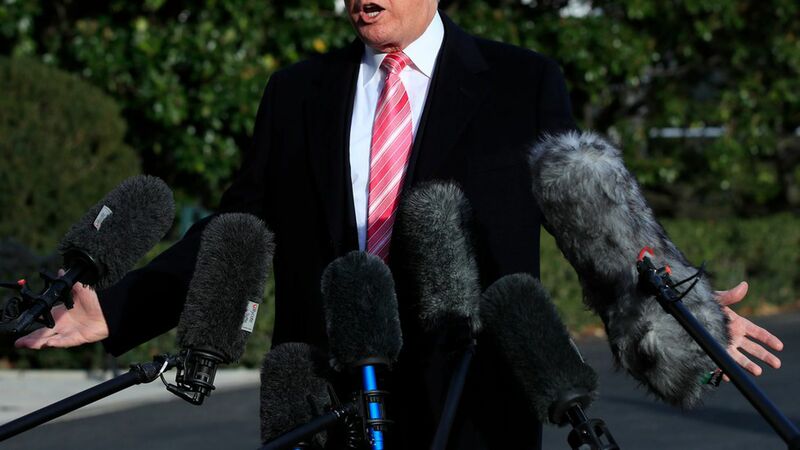 While departing the White House en route to Mar-a-Lago for Thanksgiving, President Trump signaled support for Alabama senate candidate Roy Moore, who has been plagued by sexual allegations from 9 different women. "We don't need a liberal Democrat in that seat," said Trump. "He totally denies [the accusations], you have to listen to him also ... we don't need somebody soft on crime like [Doug] Jones." Why it matters: This signals a major shift in the president's position. The White House had previously said that Moore should drop out of the race if the allegations are true. But this afternoon, Trump all but told Alabamians they should vote for Moore. Are you campaigning for Moore? "I'll let you know next week." More on Moore allegations: "I do have to say, 40 years is a long time. He has run eight races and this has never come up." What is your message to women in this pivotal moment on sexual assault? "The women are trump voters. Most of them are trump voters ... Women are very special. I think it's a very special time, a lot of things are coming out and I think that's good for our society and I think it's very, very good for women." Take note: Trump has been accused by multiple women of sexual assault and harassment.